After you've chosen the perfect cordless hedge trimmer, head to our sourcebook of top garden suppliers for more garden shopping. Unlike their tethered cousins, electric cordless hedge trimmers don’t suffer from the main downside that occasionally makes landscapers turn to petrol: that is to say, you can roam all over the place with them without having to drape multiple extension cords across the lawn, nor do you run the risk of accidentally cutting the cord – trust us, it happens! The main choices you have when it comes to buying a cordless hedge trimmer are between different blade lengths and between electric or petrol trimmers, and while blade lengths might be fairly self-explanatory (tall hedges? Go for a long reach trimmer. Just a bit of box out in the front garden? A blade up to 45cm should be ample) there are some differences that need teasing out between the two types of power before you buy. They’re also lighter and tend to be cheaper than petrol hedge trimmers, and with the advent of the 36V battery, they’re getting to be comparatively powerful too. That said, many reviewers of cordless hedge trimmers have found that the batteries can be unreliable and some don’t hold charge well, and when the cost of replacing batteries over the trimmer’s lifetime comes into play, the initial outlay for a petrol trimmer might not seem so bad. Plus, when it comes to getting through tougher branches, petrol really comes into its own, so for bigger garden jobs you might want the extra power. Not sure cordless is for you? Check out our pick of the best hedge trimmers that covers corded models too! 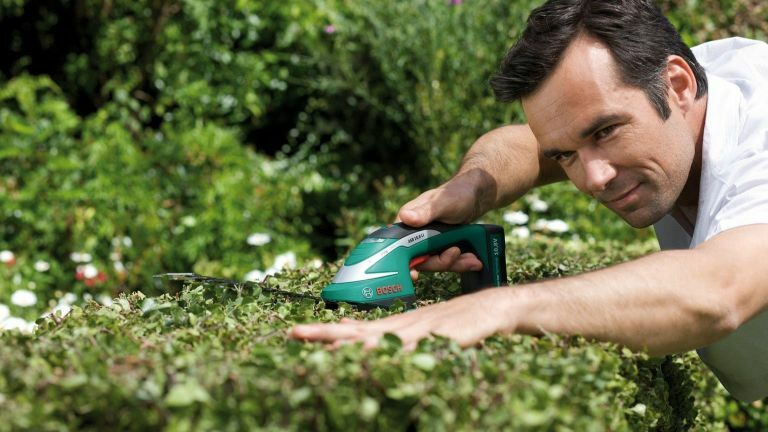 This Bosch hedge cutter takes our top spot for its ability to provide the oomph you’d look for in a petrol model, with the lighter weight and less fiddly powering of an electric cutter. Its clever anti-blocking system means your adventures in landscaping won’t be cut short by any particularly robust branches, and its blade tip protector allows you to cut closely along walls and paths without risk of damage. Reviewers raved about the long blade – suitable even for hedges over two metres – the quick-charging battery, and the sheer power, making this our best all round. Some reviewers were a little suspicious at how quiet this trimmer was when turned on, wary that that might mean a lack of power, but not so. Lightweight, but not flimsy, with a running time of around an hour (compared to our first choice pick’s already impressive 45 minutes), this is a great trimmer for domestic use, with its big feature being its anti-jam system. However, reviewers found this didn’t often come into play, as the 55cm blade was so adept at cutting through whatever they threw at it. Hefty equipment not for you? Keep smaller shrubs in shape with this lightweight handheld trimmer. Weighing in at under a kilogram, this compact hedge trimmer is the most lightweight option on our list, making it a good bet for gardeners with mobility problems or arthritis, or those who tire easily. Unlike our first two picks, it’s not big hedges that let this handheld trimmer shine – rather, it comes in extremely handy for shorter hedges and more detailed work such as keeping shaped boxes looking sharp. With its ability to be use single-handed, and its petite quick-charging battery, it’s a handy option to keep around for smaller jobs. This Einhell model is our best trimmer for tall hedges for a couple of reasons. Namely, those would be the telescopic extending handle, which makes getting to those just-out-of-reach spots a cinch, and the 90 degree pivoting attachment, which mean you can switch from neatening up the sides with the vertical trimmer to taking a bit off the top with the horizontal tool, all with the greatest of ease. The only downside is that some found it a little heavy, so that’s worth bearing in mind if you have trouble lifting. Unlike many petrol hedge cutters, this McCulloch model is designed for easy start-up, thanks to a soft-start system and primer. It also sees to another common complaint about petrol mowers, the weight, coming in at a comparatively lightweight 5 kilograms (our previous electric pick, by contrast, is 6.4 kilograms). Reviewers found that, despite its lack of back-breaking heft, it still sliced through thicker branches with ease, with one saying that compared to other trimmers they’d tried this one was like “slicing through warm butter”. Sold! If you’re not looking to drop a load of dosh on a trimmer that you’re not going to use very often, this VonHaus model is a great entry-level option. Even if you are serious about tackling the garden, it looks to be a good buy, because the fully compatible battery can be used with the rest of the range including a grass trimmer and leaf blower, meaning a slight break on the initial outlay of tooling up. Reviewers loved the light weight, the battery life and the fact that it deals well with even thicker branches, making this a great budget all-rounder.